Oxford-educated historian Joseph P. Farrell delivers the sequel to his best-selling Covert Wars and Breakaway Civilizations, part of his book series on suppressed technology, Nazi survival, secret finance and postwar hidden conflicts. His customary meticulous research and sharp analysis blow the lid off of a worldwide web of nefarious financial and technological control that very few people even suspect exists. Farrell delves deeper into the breakaway civilizations created by the Nazis in South America and other parts of the world. He elaborates on the advanced technology that they took with them at the “end” of World War II and shows how they created a huge system of hidden finance with the involvement of leading financial institutions around the world. He exposes the secret space programs used by the breakaway civilizations and reveals the clash of civilizations—a virtual secret war going on around us. He investigates the current space secrecy that involves UFOs, suppressed technologies and the hidden oligarchs who control planet Earth for their own gain and profit. Farrell probes the mystery surrounding Dr. Kurt Debus and his links to NASA and Werner von Braun. He uncovers the covert operations of Richard Bissell, the flying saucer designs of Alfred Loedding and T. Townsend Brown, and strange activity on Mars involving UFOs. He explains the magneto-hydrodynamic anti-gravity drives that would easily power such craft. He includes a continued discussion of “emulational” technologies (those that can imitate acts of god/nature, like earthquakes and storms) from the standpoint of the culture of “full spectrum dominance” and the culture of “plausible deniability.” Farrell includes plenty of astounding accounts, documents and speculation on the amazing alternative history of hidden conflicts, secret oligarchies and super technology. 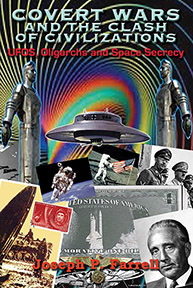 COVERT WARS AND THE CLASH OF CIVILIZATIONS: UFOs, Oligarchs and Space Secrecy By Joseph P. Farrell. 394 Pages. 6x9 Paperback. Illustrated. Bibliography.